Luxury leather company Coach is launching yet another round of Apple Watch bands, this time for the summer season. There are six new combinations of colors and designs, with all-new options on offer - as well as updated colors for designs previously unveiled. You can now pick up a Leather Strap with Tea Rose Appliqué in Black Multi; and a Printed Leather Strap in Chalk Multi, Melon Multi and Black Multi. New color options are a Rexy Leather Strap in Goldenrod yellow and a new Snake Strap in Bordeaux red. The Leather Strap with a Tea Rose Appliqué is the most expensive of the bunch at $195. The new Snake Strap is $175, the Rexy Leather Strap and the Printed Leather Straps are all $150. You can order direct from Coach now. 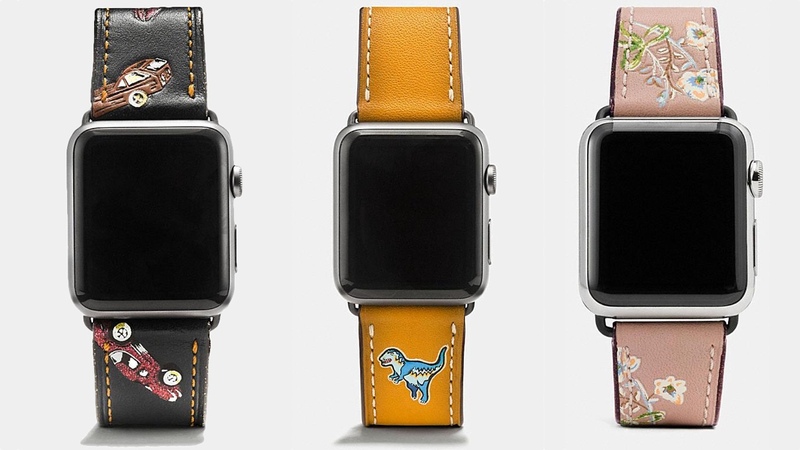 As with all collections of new Coach Apple Watch straps, the designs are limited availability - apparently on 200 or so of each option will be made (although older lines have also been restocked). After debuting its first set of straps last year, Coach has refreshed the line a few times - most recently in May. If these fancy designs don't do it for you, maybe check out the newest Apple Apple in-house bands or have a look at the huge array of third-party Apple Watch straps.